From your bouquet to the boutineers, the dance floor to the drink menu, and your hair style to the honeymoon, you have a "one of a kind, got it from Etsy, totally and completely us" wedding in mind. So it makes sense that you'd be ditching the rented ties that smell like a previous groomsmen spilled his beer on it last weekend and opting instead for a tasteful, unique detail to your grooms' guys. Here are 12 tie, bow tie, and suspender ideas for any style or color of wedding that'll take your wedding from meh to GORGEOUS. I also threw in a few bow tie + suspender combos for any littles in your wedding because #CUTE! I love a good pattern mixed in the sea of a groomsman's plain colored suit. These denim ties would look beautiful against a navy or white shirt. And, they'd match your bridesmaids perfectly if they're also wearing navy or light blue. A classy wedding is often in the details, so why not add a splash of rose gold in the outfit mix? These ties would pair perfectly with most colors and they're neutral enough that your bridesmaids don't really need to match with them, either. Navy floral tie on top of navy?! Love this look, especially if you're planning a fall wedding. All hail neutrals! The texture on the tie balances out the smooth suspenders, creating an adorable look for the littles in your bridal party. 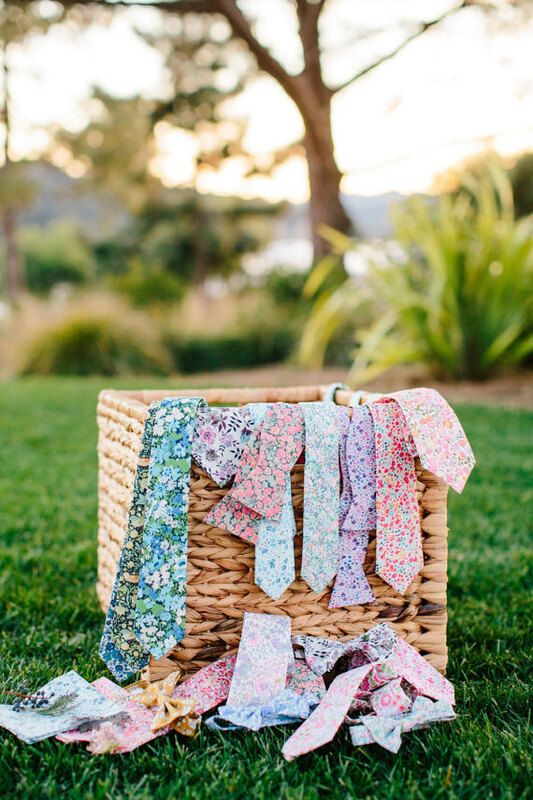 If you're planning a spring wedding and want to go all out with a smashingly bold color palette, these floral ties will do just the trick. Choose different patterns and pair with dark shirts to create a balanced look. I don't have a little boy, but if I did, I think I'd be tempted to dress him up in a bow tie and suspenders every day. Because, I mean, how adorable?! This navy and burgundy combination is perfect for a fall wedding! This gorgeous apricot tie would look adorable on a little ring bearer for a spring, pastel wedding. Pair these brightly colored plaid bow ties with the groomsmen floral ties and you'll be throwing the most colorful, summer-time wedding! I think these are definitely my favorite bow ties in this whole list. I can't get over the soft colors and gorgeous florals! If you have a few littles or want your groomsmen in bow ties, you could mix and match these for an eclectic, stunning look. So precious! This navy and white polka dot bow tie and brown suspender combination is adorable for a little boy and would look great on the whole groomsmen party, too. And, lastly, just in case you didn't see any of the colors you want, here's a neutral rainbow of linen bow ties that would look fantastic with any color palette!